The most practical way of increasing the efficiency of an internal combustion engine is to increase the brake mean effective pressure (BMEP) in the cylinder. 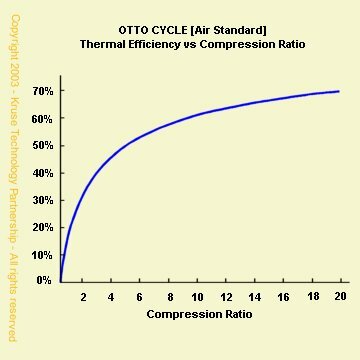 The higher the BMEP, the greater the thermal efficiency in fuel conversion. This is normally achieved by increasing the compression ratio and/or providing boost with a turbocharger or supercharger. Evidence of the increased level of efficiency is apparent in the operation of the compression-ignition Diesel cycle engine, where good power and fuel economy are achieved at high BMEPs. The spark-ignition Otto cycle process on the other hand, although potentially more efficient, has not been able to realize its full potential due to the difficulties in overcoming the onset of auto-ignition without the use of environmentally unfriendly knock inhibitors, such as tetra-ethyl lead, etc. Current mass production Otto cycle engines have therefore been limited to effective BMEPs of below 10.5:1 and have thus been constrained in the levels of efficiency that can be achieved. The recent introduction of direct injection gasoline (petrol) engines has partly mitigated the auto-ignition problem, as the vaporization of fuel injected into the cylinder reduces the temperature generated by compression and thereby reduces peak temperatures. BMEPs of 12:1 with commensurate gains in efficiency are therefore being extolled as a virtue of the Gasoline Direct Injection (GDI) engine. Given that the limiting event (auto-ignition) is caused by a combination of pressure, temperature and the chemistry of the fuel/air mixture in the cylinder, it follows that the control of temperature or pressure for a given fuel/air mixture will result in the elimination of auto-ignition. As higher BMEPs are required to increase operational efficiency, then control of the combustion temperature, as the pressure increases, is paramount to reaching that objective. Consider a fireplace in a room and a quantity of logs that are to be used as fuel. The objective is to raise the temperature in the room by burning the logs. These can be put on the fire in either of two ways: a) they can all be burnt in one go, or b) each log can be added until all of them have been burnt. In both cases the same amount of heat is added to the room, but the heat release in the first method is unregulated and gives rise to a high peak temperature, whereas the second is controlled (limited) and results in a lower and more even temperature over time - an isothermal heat release process. The Kruse Limited Temperature Cycle, in much the same way, is the process which regulates the timing and the quantity of fuel injected into the cylinder, and thus the peak combustion temperature. Limiting the temperature of combustion has two significant automotive benefits. Firstly, it allows BMEPs to be increased, so that spark-ignition engines can reach the same or greater levels of operating efficiency as the diesel engine. Secondly, it reduces the creation of Nitrogen Oxide (NOx) in diesel engines by as much as 80%, thereby allowing diesel engine manufacturers to meet 2007 and 2008 emission requirements.